Mansfield Lovell (1822-84), Major General, CSA (Washington DC). Commanding New Orleans, Corinth. 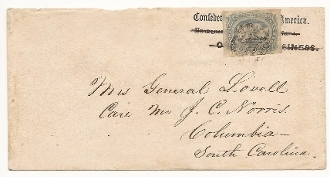 Envelope addressed to his wife Mrs. General Lovell in Columbia, South Carolina. CS #11, Army grid cancel on Confederate States of America Head Quarters Department No.1 (Type 2) imprint cover.